Born: 20 September 1872, Brooklyn, New York, United States of America. Died: 7 June 1955, Pretoria, South Africa. 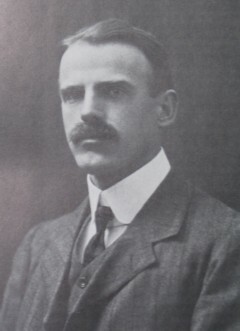 Charles P. Lounsbury, pioneer economic entomologist in South Africa, was the son of Paul Lounsbury and his wife Elizabeth, born Anderson. He studied at the Amherst Agricultural College and Experiment Station in Massachusetts and was awarded the degree Bachelor of Science (BSc). He remained at the college as a graduate student and instructor until 1895. At that time the Department of Agriculture of the Cape Colony felt the need to appoint a full-time economic entomologist - one that would not demand too high a salary - and Lounsbury, aged only 23, was recommended for the post by senior staff of his college. His appointment, the first of its kind in all of Africa, was a milestone in the history of local economic entomology. He arrived for duty on 22 August 1895 and applied himself with great energy to the study of the Colony's most serious insect pests. Many of his official trips in the Western Cape during the first few years were made on his bicycle. Initially he concentrated on insects injurious to fruit trees, but soon included in his activities pests of other crops, veterinary entomology, and legislation to regulate plant imports. In his first annual report, covering only four months of 1895, Lounsbury dealt with nine of the most important insect pests and their control. By March 1896 he had compiled a spray calendar for fourteen insect pests of fruit trees and five diseases, recommending specific sprays, indicating how to make them, what the ingredients cost, what spraying equipment to use, and where it might be bought. That same year he had a fumigation facility erected at the Cape Town docks where imported plants could be treated with hydrocyanic acid gas - probably the first such government facility in the world. In 1898 he began his studies of ticks, a project to which he gave much time during the next few years. Thus in 1900 he demonstrated that heartwater is transmitted by the bont tick, in 1901 that malignant jaundice in dogs (biliary fever) is transmitted by the adult dog tick, and in 1903 that east coast fever is transmitted by the brown tick. Furthermore, his research on the life histories of various tick species enabled him to recommend the most effective cattle dipping programmes, and more efficient dips. On the basis of his tick studies he acquired an international reputation as an expert on ticks, and in 1903 the Cape government acknowledged the value of his work by allocating funds for setting up an entomological laboratory at Rosebank, Cape Town. He also gave attention to the use of both indigenous and exotic ladybirds to control plant-feeding insects, and while on a visit to the United States in 1900 sent 17 species of ladybirds to the Cape. However, this method of control proved unsuccessful. In 1905 he helped to form the South African Central Locust Bureau, the first international locust organisation, which was joined by all the southern African colonies and protectorates. After a long struggle he gradually convinced the authorities and farmers that the importation of plants had to be controlled to prevent the introduction and spread of plant pests and diseases, and eventually he drafted the plant import regulations and nursery registration laws under the Agricultural Pests Act of 1911. Lounsbury initially worked alone, but was later assisted by Claude Fuller* (1897-1899), C.W. Mally* (1900-1905, 1907-), R.W. Jack* (1905-1909), W.R. Dewar* (1905-1907), T.F. Dreyer* (1905-1907), B.J. Graham (from 1907), and C.K. Brain* (from 1909). When the Union of South Africa was formed in 1910 he was the obvious choice for the post of chief of the Division of Entomology in the Union Department of Agriculture, with its headquarters in Pretoria. He held this post from 1911 until his retirement in January 1927 and though he had to spend an increasing proportion of his time on administrative work, retained a lively interest in the research and investigative work carried out by his staff. Eventually his Division was organised into sections for apiculture, locust research, forest entomology, termite research, wattle pests, and cotton insects and plant pathology services, each led by a specialist entomologist. Lounsbury was a very energetic scientist who focussed most of his efforts on finding practical solutions to the entomological problems he faced. One of his outstanding characteristics was his remarkable memory. In the course of his career he published hundreds of articles, which formed the basis of our knowledge of the topics he dealt with. Most of these appeared in the Agricultural Journal of the Cape of Good Hope, often in the form of notes and letters. Twenty-one of his papers were published in the form of pamphlets by the Cape Department of Agriculture during 1896-1899. Examples of his more important papers in the Agricultural Journal are: "Codling Moth" (1898, Vol. 13, pp. 597-616, 724-726), "Insect pests" (1899, Vol. 14, pp. 160-176), "The bont tick, Amblyomma hebraeum Koch, its life history and habits" (1899, Vol. 15, pp. 728-743), "Tick-heartwater experiments" (1900, Vol. 16, pp. 682-687), "Transmission of malignant jaundice of the dog by a species of tick" (1901, Vol. 19, pp. 714-724), "Persian sheep and heartwater" (with W. Robertson*, 1904, Vol. 25, pp. 175-186), and "Ticks and African Coast Fever" (1906, Vol. 28, pp. 634-654). Some other important papers by him were "Insect pests in South Africa", a detailed review of his work on tick-borne diseases (in W. Flint and J.D.F. Gilchrist (eds), Science in South Africa, 1905, pp. 362-374); "Habits and peculiarities of some South African ticks", dealing with the metamorphic, alimentary, reproductive and habitational differences between various tick species (Addresses and papers read at the joint meeting of the British and South African Associations for the Advancement of Science held in South Africa, 1905, Vol. 3, pp. 14-26); and "Transmission of certain diseases by ticks" (Ibid, Vol. 3, pp. 381-394). His reminiscences on "The pioneer period of economic entomology in South Africa" were published in the Journal of the Entomological Society of South Africa in 1940. During his career in the Cape Lounsbury corresponded extensively with entomologists in the United States and Australia. He was a Fellow of the (British) Entomological Society and a member of the American Society of Economic Entomologists. In 1895, the year of his arrival, he became a member of the South African Philosophical Society and remained a member until it became the Royal Society of South Africa in 1908. He was elected a founding Fellow of the latter and served on its council in 1916-1917 and 1921-1922. He joined the South African Association for the Advancement of Science in 1902, the year of its formation, and served as president of Section C in 1915. In 1916 he became a foundation member of the South African Biological Society. During his later years he was a member of the Pretoria Entomology Club, in which was active from 1933 to 1936. He was awarded the South Africa Medal (gold) of the South African Association for the Advancement of Science in 1915. Lounsbury married Rose Linda Davis of Amherst, Massachusetts, in 1895 and they had one son. Following her death in 1920 he married Edith Impey of Pretoria in 1922. Agricultural Journal (Union of South Africa), 1911-1913, Vol. 2, 5 and 6 (articles by Lounsbury). Agricultural Journal of the Cape of Good Hope, 1896-1906, Vol. 9-29. Alexander, R.A. et al. The Onderstepoort Veterinary Research Laboratory, 1908-1958. Onderstepoort Journal of Veterinary Research, 1961, Vol. 28, pp. 569-651. Bedford, E.C.G. The early years of the Entomological Society of Southern Africa, 1937-1960. Journal of the Entomological Society of Southern Africa, 1961, Vol. 24, pp. 3-16. Brown, K. Political entomology: the insectile challenge to agricultural development in the Cape Colony, 1895-1910. Journal of Southern African Studies, 2003, Vol. 29(2), pp. 529-549. Cape of Good Hope. Civil service list, 1896. Cape of Good Hope. Report of the Government Entomologist, 1895-1909. Henning, M.W. Animal diseases in South Africa (2 vols). Central News Agency, 1932. In Memoriam: C.P. Lounsbury. South African Biological Society Pamphlets, 1955, No. 17, pp. 69-70. Lounsbury, C.P. The pioneer period of economic entomology in South Africa. Journal of the Entomological Society of Southern Africa, 1940, Vol. 3, pp. 9-29. National Automated Archival Information Retrieval System (NAAIRS). http://www.national.archives.gov.za/naairs.htm Documents relating to Charles Pugsley Lounsbury / Charles P. Lounsbury. Obituary: The late Mr C.P. Lounsbury. Journal of the Entomological Society of Southern Africa, 1955, Vol. 18, pp. 144-148. Royal Society of South Africa. Transactions, 1908-1910, Vol. 1 and 1917, Vol. 6: Lists of Fellows and members; 1925, Vol. 12, Minutes of Proceedings. Smit, B. A further chapter in the history of entomology in South Afica. Journal of the Entomological Society of Southern Africa, 1960, Vol. 23, pp. 3-15. South African Association for the Advancement of Science. Report, 1903, 1905/6, 1910, 1915, 1918: Lists of members and office bearers. South African Journal of Natural History, 1918, Vol. 1(1), pp. 8-15: Roll of Foundation Members [of the SA Biological Society]. South African Philosophical Society. Transactions, 1897-1907, Vol. 9, 10, 16, 17: Lists of members.